Happy Monday! I woke up to a winter wonderland on Saturday! The snow was beautiful and I was so glad that it happened on a day I did not have to drive to work! Today, I have teamed up with some fabulous bloggers to show you how to style your holiday look for less! 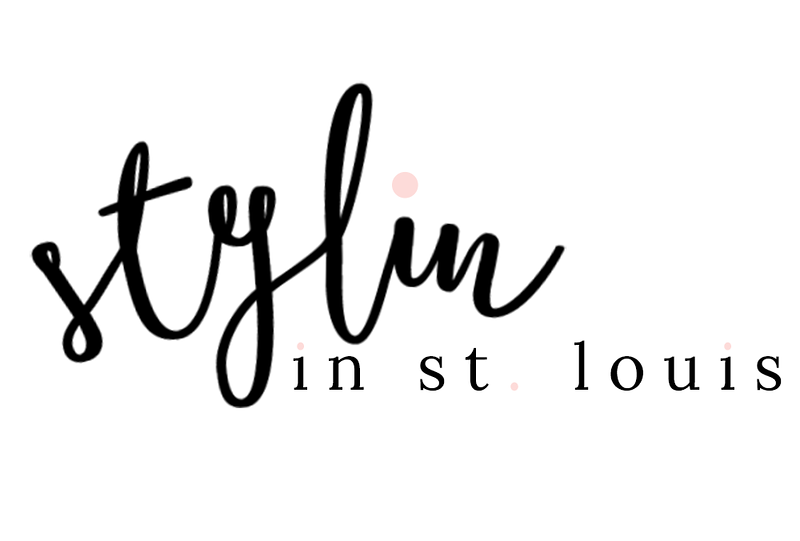 A few weeks ago we brought you how to style fall for less, we are back again! 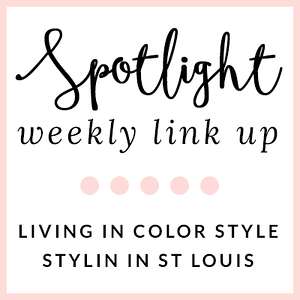 Be sure to check out some of these fabulous bloggers! This is adorable! I would never have thought to layer sparkles over plaid! I am doing a Christmas link up tomorrow - you should so link this up! Your fashion sense is so awesome! Love this I'm a huge budget shopper and my whole lifestyle is budget friendly. thanks for sharing all those bloggers! Love that sequins over the blouse. Thanks so much for joining in the Collab! Thanks Becky! So glad we could collab again! Great holiday look! Love the pattern mixing and that skirt is fabulous. LOVE! I really love how you paired your fancy sequins with flannel (I totally am posting a similar look on my blog this week! ha!) 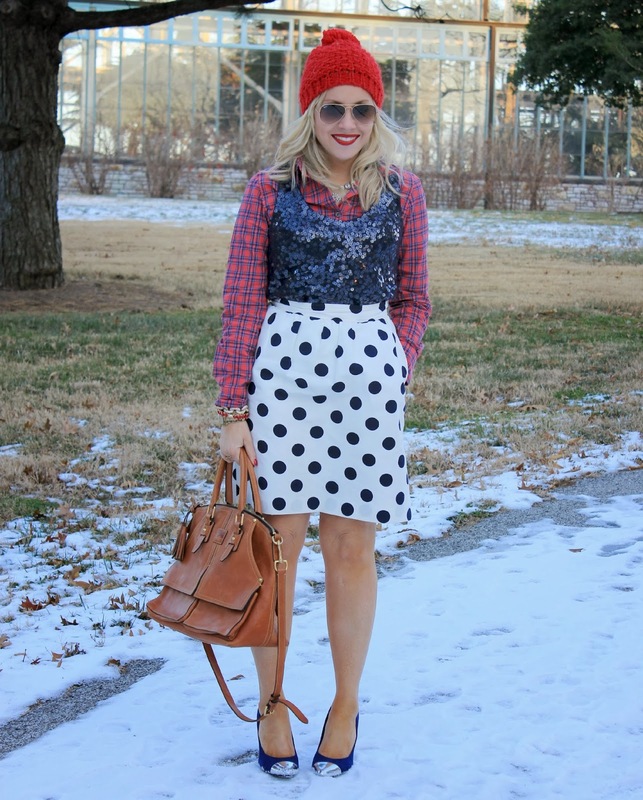 and I of course love a good print mix - that polka dot skirt is too cute! Thanks Katie! I tend to add way too many layers! Love that skirt! Adorable with the sequins + plaid. Cute! Love the hat! You girls all put together such great holiday looks! Thanks! I have been wearing it a lot! Old Navy! Super cute. Love the skirt and your sequins. Happy Monday..XO!! Thanks Sharon! Pattern mixing is a lot of fun! Love this festive look! You are always the layering queen! I loveeeeeee that polka dot skirt!!! This entire look could not possibly be any better! You look amazing, perfect mix of prints! This is so so so so so so perfect. Love it all! So adorable!! Love it! You look fabulous!! My favorite places to shop! Sales are my favorite! I got this purse on sale this past summer! Thanks Jackie! It was a last minute...I am going to be late for work outfit! Find something quick! This is pinterest worthy! Thank you for the inspiration! 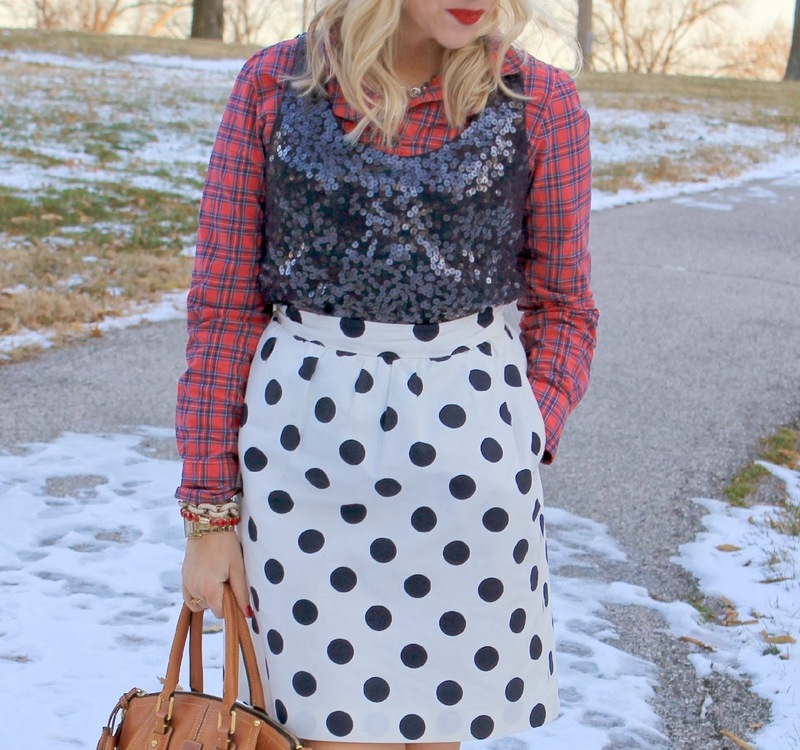 Sequins, dots, plaid, perfection! Thanks Carylee! I had to watch myself! The ice is what does not make it fun! I ended up replicating your outfit today! It's scheduled to post tomorrow (which I guess is today!) morning! Such a great look - thanks again for the inspiration!! This look is so perfect! The plaid, the sequins, the dots... I just love it! Your layering + pattern mixing here is flawless! And love love love the heels. Ah! Simply love everything about this look! You look adorable, as per usual.